According to UN predictions, the population of the Earth will rise to nearly ten billion by 2050. Together with the trend toward urbanization, this will result in the accelerated growth of megacities around the world – by 2050, 22 percent of all people will live in one. And they will be especially vulnerable there. Currently, 62 percent of the cities with populations of eight million or more lie on the coast. Consider Bangkok: the population of Thailand’s capital city has rapidly grown to around 10 million. The mostly poor residents of the Venice of the East, located on the Chao Phraya Delta and threaded with many canals and waterways, live in constant fear of the Three Sisters. That’s what they call the trinity of high river floodwaters, strong rains, and storm floods that are growing increasingly dangerous due to climate change. They have good reason to fear them: in 2011 the Three Sisters paid a shared visit to the city. Due to an unusually long and strong monsoon the river breached its banks while at the same time a spring tide prevented the floodwaters from draining off into the sea. 657 people lost their lives and the damages were enormous. The effects were even felt hundreds of miles away in Western offices: the price of computer hard drives doubled in the aftermath because nearly 50 percent of all hard drives are produced in the Bangkok region. 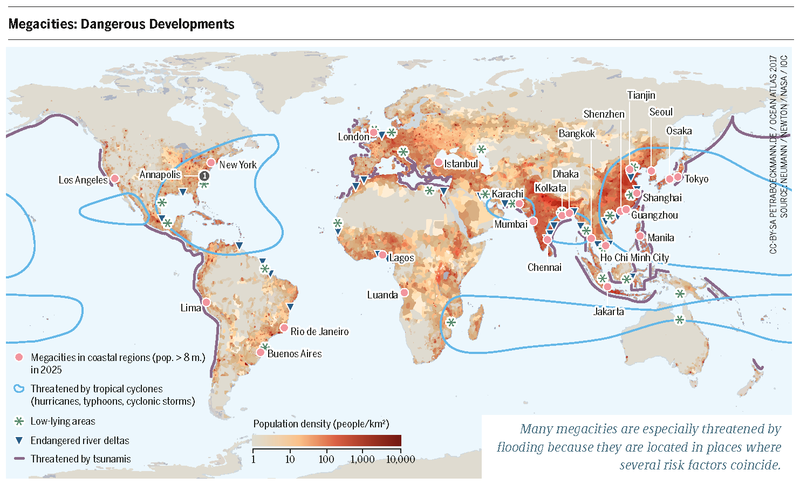 The megacities located on river deltas, like Bangkok, New York, Shanghai, Tokyo, and Jakarta, are considered hotspots of vulnerability. They are the high-risk zones of the ocean crisis. They are especially threatened by “100 year” events, like exceptionally severe flooding. In river deltas, the largest threats to cities come together in a fatal way. In addition to the Three Sisters, the biggest threat is accelerating subsidence, meaning that the land on which the cities stand is actually sinking. Bangkok, Shanghai, and New Orleans have each sunk up to three meters in the 20th century. Tokyo and Jakarta have sunk four. Parts of these cities already lie well below sea level. Subsidence is a natural process in delta regions, but the extreme acceleration is once again a self-inflicted wound. 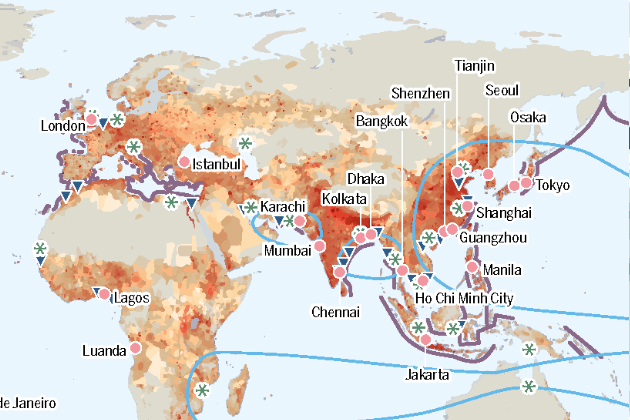 Groundwater extraction and the compaction of the soil by the weight of unrestrained construction booms have taken their toll and the megacities are sinking – in some cases, twenty times faster than the sea level is rising. 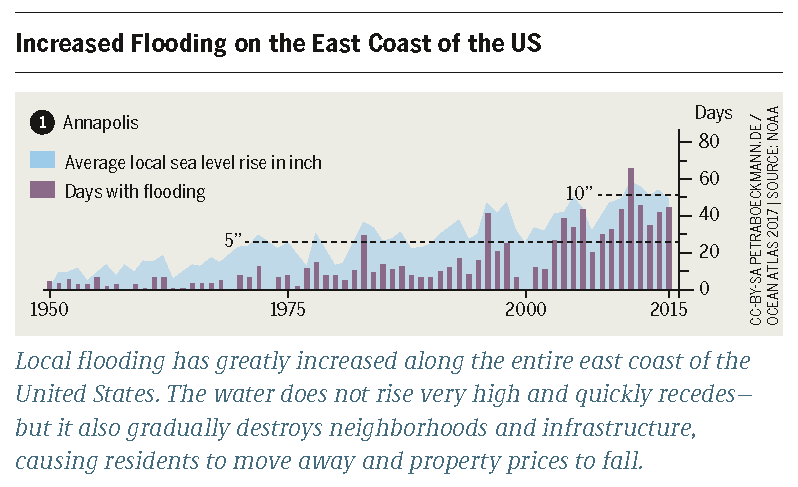 In the 20th century the global average increase in sea level was approximately 20 centimeters. An additional driver of accelerated subsidence is the dams that have been erected on the large rivers that feed the deltas. They hold back sand and sediment that would normally be washed out to sea. That flow of silt is what originally created the deltas over several millennia. Now, in many cases only 50 percent of the typical quantity of silt actually makes it to the delta. Because of dams and additional river regulation measures, the deltas have no way of replenishing themselves. They are slowly disappearing as the tides constantly pull sand into the sea. Scientists and urban planners are already asking if these cities can be maintained over the long term or if they will eventually have to be given up – even though they are growing rapidly. It is an enormous challenge for high-risk cities like Tokyo, New Orleans, and New York, which was hit by Hurricane Sandy in 2012. These wealthy cities invest billions in high-tech protective systems and building fortifications against the threat from the sea. But many developing and emerging countries lack the financial resources or awareness necessary to take timely action against the manifest threats. And the question of whether only those who can afford protective systems will survive is not just a global matter. When Bangkok was threatened by flooding, the government erected a 77-kilometer-long protective wall of sandbags, dividing the metropolitan region into areas in front of and behind the dike, setting apart the protected and the defenseless. When the flood hit, the people outside the dike tried to pierce through to allow the water to dissipate. The violent confrontations that ensued illustrate the potential for future conflicts, because the walls, pumps, and dikes typically protect the more affluent areas. For these social reasons alone, building floodwalls that divide cities and regions cannot be the only solution. Another large threat, not only to the megacities but also to all people and settlements in the endangered coastal regions, is tsunamis. 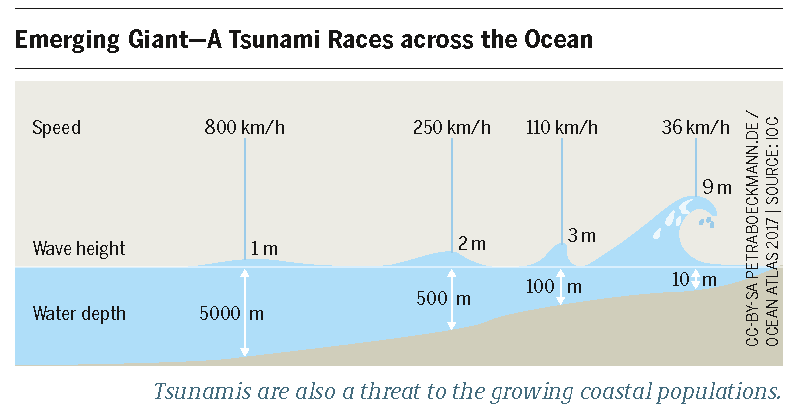 The probability of a tsunami is low but the effects are overwhelming when one considers the catastrophic results along the coasts of the Indian Ocean in 2004 and the east coast of Japan in 2011. Every endangered metropolis, every city, and the global community as a whole must engage in an open dialogue: What should we protect? What can we protect? What is sustainable? What is just? The situation on the coasts changes constantly and plans must be continually revised and adjusted. The needs and experiences of the population must be surveyed and considered and new protective measures that are in harmony with nature must be devised. In some cases, that may mean that land must be relinquished to the sea in order to protect it elsewhere.